Tempest Theatre is a flexible black box theatre space that can seat up to 200, depending upon its configuration. The theatre is equipped with movable seating risers that allow flexible seating arrangements and a lighting grid that covers the entire space. 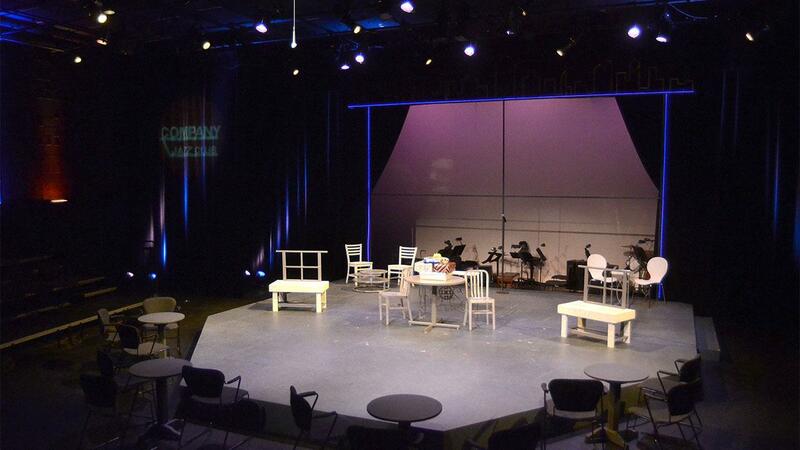 In recent productions, such as Cabaret, The Crucible, The Tempest, A Dream Play, Urinetown: The Musical, and The Diary of Anne Frank, the seating has been configured as a proscenium stage, a thrust stage, a corner stage, and an alley stage. The moveable seating allows us to arrange audience seats and acting space into whatever shape that is best for the play. There are multiple entrances into Tempest Theatre. Connected to the theatre is the Tempest Scene Shop. The scene shop is fully equipped with state of the art tools, including a DeWalt sliding compound miter saw and a Saw Stop table saw. Saw Stop uses technology that will instantaneously stop the blade when it senses the temperature of a human hand, effectively eliminating the risk of serious injury. In addition to the carpentry equipment, the scene shop is equipped for work with plastics, foam and metal – including light structural welding. The Lincoln Electric Pro-Mig 140 wire-feed welder is a new addition to our shop. 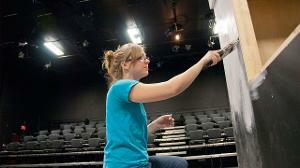 We offer five to six student assistantships in the scene shop for our students to gain additional experience. Also connected to Tempest Theatre is a paint/electrics shop. One section of this large room is equipped with a durable utility sink and storage space for painting supplies and equipment. The remainder of the room houses our lighting equipment which includes a number of ETC Source Four and Source Four PAR lighting fixtures along with a stock of zoom instruments, strip lights and other spot and flood lights. Above the paint/electrics shop is our properties storage and control booth. The control booth provides good visibility of Tempest Theatre and is equipped with an ETC Express programmable lighting console, an Allen & Heath 14 channel mixing board, and a variety of sound playback options. The department utilizes sound editing and playback software on a dedicated sound laptop. Across the hall from Tempest Theatre is our costume shop. The Department of Theatre and Dance of Elizabethtown College’s Division of Fine and Performing Arts houses a fully equipped costume shop. Its equipment consists of 6 sewing machines, a serger, adjustable clothing forms, steamer, irons and ironing board, a washer and dryer, and the necessary sewing tools and notions for building and altering costumes all in one shop. In addition, there is a small but growing stock of costumes from which to pull. The shop is staffed by one faculty member, who also oversees the costume shop, and one or two paid student assistants. Costumes are designed and created either in-house with student designers, or by local professional costumer designers with the help of students and the faculty costume manager. Designers are culled from the several theaters in the Lancaster and Harrisburg area, so students are able to work alongside skilled, experienced personnel. The strong presence of professional and community theaters within a short drive from campus also provides opportunities for internships and volunteer work in not only costuming, but in all areas of the theatre industry. 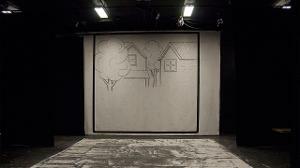 Also, directly across the hallway from Tempest Theatre reside the green room and dressing rooms. The program is equipped with two dressing rooms – one male, and one female. Each dressing room is equipped with approximately ten mirrored makeup stations. A Clear Com communication system allows the performers to keep track of what is happening in Tempest Theatre while in the green room, the dressing rooms, the costume shop, and the dance studio.